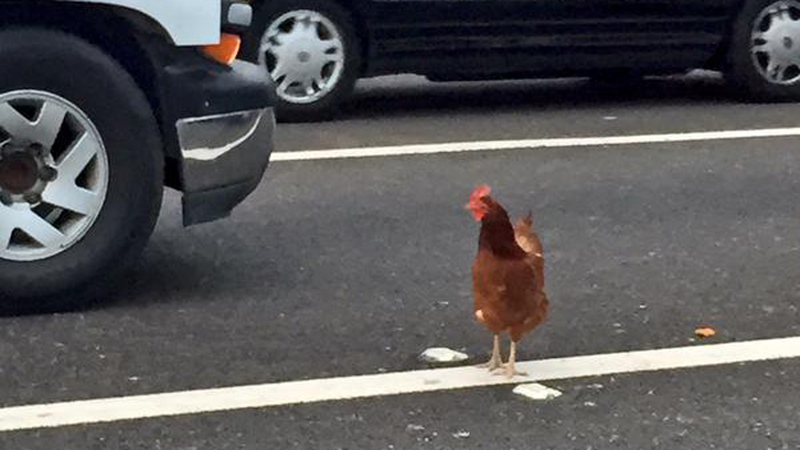 OAKLAND, Calif -- The fowl that played chicken with commuters at the Bay Bridge toll plaza has been caught by CHP. Drivers reported multiple chickens running through the lanes during Wednesday morning's commute, explained CHP Officer Sean Wilkenfeld. The first calls came in around 9 a.m.
Traffic was congested, but Wilkenfeld said it was not necessarily because of the roaming birds. "It's already backed up in the mornings," he said. CHP warned drivers remain in their cars and not get out to try to catch the chickens. "Let #CHP find out why the chickens crossed the road, it's not worth getting hit!" the agency tweeted. No one has stepped forward to claim the chickens or reported missing birds yet, Wilkenfeld said.